The top U.S. commander in Afghanistan said Thursday that Russia and Iran are supporting the Taliban in part to undermine the U.S. and NATO mission to attain peace and stability in the nation. 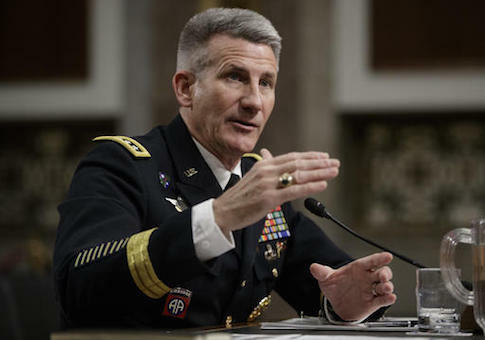 Army Gen. John Nicholson told the Senate Armed Services Committee that Iran is providing the Taliban in western Afghanistan with military and logistical support. Tehran also is recruiting Shiite fighters in Afghanistan to fight against the Islamic State in Syria and Iraq, raising concerns that these militants will return and destabilize the nation, Nicholson testified. Nicholson said Russia's involvement in Afghanistan has become "more difficult" over the past year, as Moscow has worked to "publicly legitimize" the Taliban. Russian officials argue the Taliban is fighting the Islamic State while the Afghan government has done nothing, inaction they say threatens greater turmoil in the country. Nicholson said this is a "false narrative" intended to give the group credibility. A report published last month by the special inspector general for Afghanistan reconstruction noted the Afghan government lost control or influence of 15 percent of its territory from Nov. 2015 to Nov. 2016. "Russia, Iran, and al Qaeda are playing significant roles in Afghanistan—this wasn't the case a few years ago," Nicholson testified. "I believe [these actions] are in part to undermine the United States and NATO, and prevent this strong partnership that we have with the Afghans in the region." In December, Russia hosted a trilateral meeting in Moscow with the top foreign ministry officials from Pakistan and China to review the growing threat of ISIS in Afghanistan. The discussions drew ire from Afghan President Ashraf Ghani, who questioned Russia's motives because it did not invite his government. Nicholson said Afghanistan's exclusion from the meeting undercut U.S. and NATO efforts to hand over full authority to the Afghan government to map out a peace agreement. Nicholson said an Afghan-led peace process would be more enduring than one crafted by external actors. Russian Foreign Minster Sergei Lavrov announced Tuesday that the Kremlin had extended to Afghanistan an invitation to another round of talks set to begin later this month. Senior officials from China, Iran, India, and Pakistan will attend the talks. The United States has not been involved in the Russian-led discussions. Nicholson's testimony came as congressional leaders ramp up pressure on President Donald Trump to consider a new course for the 15-year war in Afghanistan. Trump has said little of the war since his inauguration last month, and hardly mentioned it while on the campaign trail. Nicholson said U.S. and coalition efforts in Afghanistan are now at a "stalemate." With nearly 12,500 American and NATO forces on the ground in the country, Nicholson said he needed a "few thousand" more troops for the train, advise, and assist mission. He said the troop additions could come from the United States or its allies. This entry was posted in National Security and tagged Afghanistan, Iran, Russia. Bookmark the permalink.